This water logged landscape gives very little traction to the roots of heavy deciduous trees and they fall at the first spell of very wet and windy weather. The tangle of dead branches and smooth water surface makes an interesting pattern and texture. Three colours used again, Cadmium Yellow, Burnt Umber and Prussian Blue plus white and no black. The technique is very liquid, something I haven’t done in a while. Dry brush work has a softness and does not express the detail found in a subject like this. The painting has a ‘watercolour’ look and this is not surprising as the paint was very solvent rich and was flowing like watercolour. The initial colours were thin and wet and allowed to ‘dry’ with the help of a hair dryer. Onto this was drawn the darker trees and foliage – very much a ‘watercolour’ approach. Of course in the final stages the lightest colours were added in the normal oil painting way. Here is the video, see you soon. 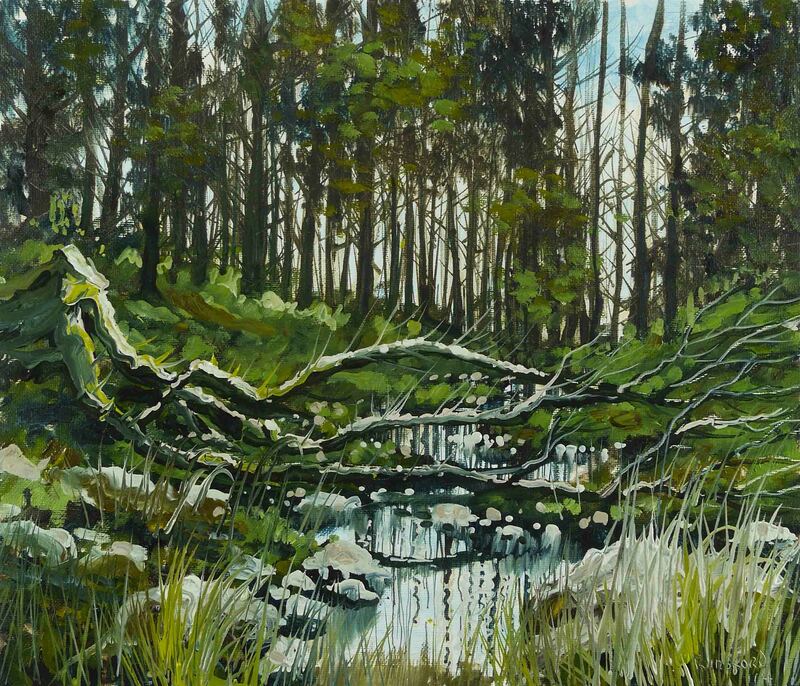 This entry was posted in Oil Painting and tagged Art, Culture, Ireland, landscape, Oil Painting, painting, Woodland. Bookmark the permalink. Thank you again Rosie, always a lovely comment. Thank you Marian. I’m delighted you enjoyed. Thank you it is great, since you start adding the music it is like going to watch a nice concert by maestro Liam! Thank you. Finally YouTube sorted out the copyright issues associated with using background music. It is a known issue. But it made it even better not that your great paintings needed any better. I love your style and enjoy to learn from your work. Now I also enjoy the music too thank you. Love this picture! The definition in the fallen tree and reflection are some of the best stuff I’ve seen of yours. A question, if you don’t mind. My mother is an incredible artist, oils. How long does it take you to do a painting? My Mom can takes years or a few months or weeks, depending on whether it’s for herself or a commission. Just curious. Thank you. I rarely spend more than 2 hours on a painting. I start and finish in a single painting session. This means I’m always painting ‘wet on wet’ and some of my unusual practices, like solvent and no medium, limited colours etc are because of this. This is not everyone’s ‘cup of tea’ but I wouldn’t have the patience required to work in a traditional manner. Another advantage of this quick painting is that I can video an entire painting by just turning on the camera when I start and off when I finish and I have a complete video which is then speeded up and uploaded to YouTube all on the same day. I love knowing that there will come a point when it looks like you’ve overworked perfection …and then it quickly becomes apparent that it’s simply part of the plan. Watching it come together so beautifully – with the last minute unexpected touches – is an education every time. THANKS…it´s so much I have received from you… I had never seen time lapse painting, yours is more than extraordinary. Beautiful music an overall enhancement. I´m located in Talca, Chile. You are very welcome Licha. Your country must be very beautiful, from tropical north to cold south. Lots of inspiring landscapes.